Life-saving food supplies are loaded from a river barge onto trucks destined for distribution in Malakal town, South Sudan. 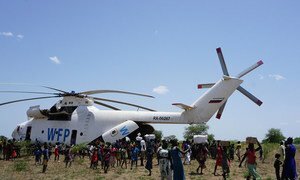 For the first time since civil war erupted in South Sudan in 2013, a United Nations food convoy has managed to deliver thousands of tonnes of aid by river, to people in seven hard-to-reach locations, saving millions of dollars on costly aid flights. The World Food Programme (WFP) convoy transported just over 750 tonnes of food and nutrition supplies up the Sobat river, a major tributary of the White Nile. 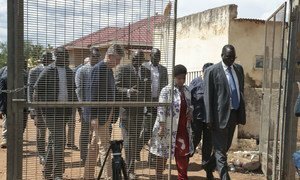 This meant negotiating access and security guarantees to allow safe-passage for the vessels through the Greater Upper Nile region, where thousands of South Sudanese people have been displaced by the war, said WFP. Life-saving aid for the isolated counties of Ulang, Luapiny and Nyirol, was previously only delivered by airdrop, which costs around six times more than using river or road transport. The first convoy was loaded in Renk, composed of one barge and 11 smaller vessels that transported supplies of sorghum, pulses, vegetable oil and porridge - enough to sustain 40,000 people for one month. According to a new Integrated Food Security Phase Classification (IPC) report, backed by multiple UN agencies, 6.1 million people in South Sudan - approximately half of the population - face severe food shortages. In response to these growing humanitarian needs, WFP is now providing emergency food supplies to 5 million people using road, air and river routes. Putting the latest peace deal into real effect across South Sudan, must include addressing “in a stronger manner, the challenges facing women and girls”, said the UN’s leading voice for gender-equality, who is part of a joint United Nations-African Union delegation to the country this week.